If you are a resident of Fayetteville, North Carolina or the surrounding areas, then you know that there have been days when it seemed like the rain would never stop. Here at ZipQuest Waterfall & Treetop Adventure, we tend to really take notice of the rainy days. 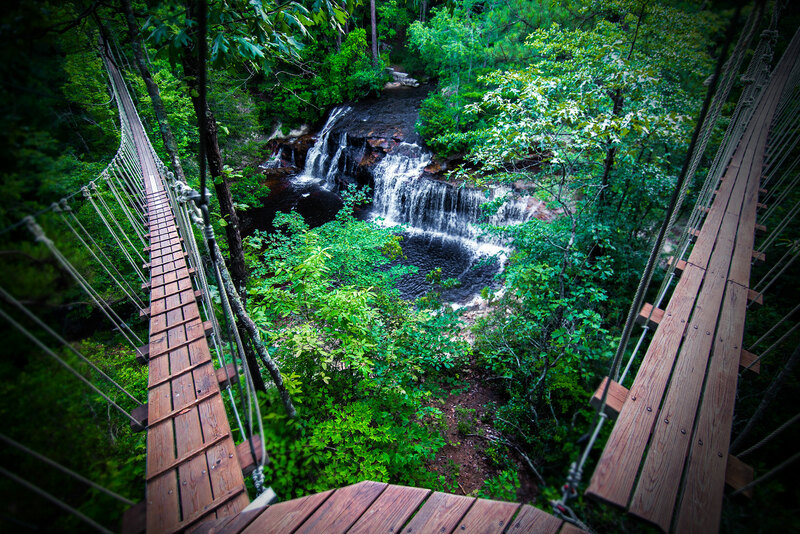 Although ziplining in the rain may not be how many people want to experience ziplining, we have to admit that our ZipQuest grounds and Carver Falls are still beautiful when it happens. 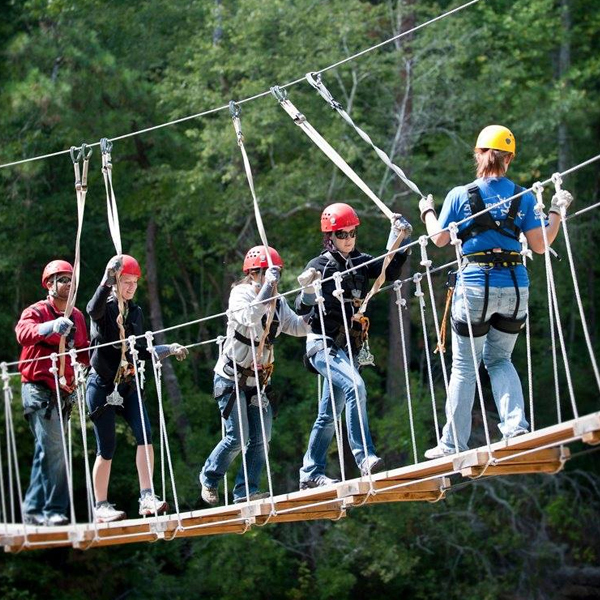 However, if ziplining in rainy and cold weather is not what you have in mind for your family, we have found other exciting indoor activities for families to enjoy in Fayetteville, North Carolina. Located in downtown Fayetteville on Green Street, the Fascinate-U Children’s Museum is full of hands-on activities for children and interactive exhibits. Children can spend hours getting lost in their imaginations in the museum that has been opened since 1994. If you are looking for a highly affordable family experience, especially for school-aged children, Fascinate-U is a great option. Another educational and interesting activity for a rainy day in Fayetteville, NC is a visit to the Airborne and Special Operations Museum, located downtown on Bragg Boulevard. The museum is free and centers on the history of special operations and airborne soldiers from 1940 until today. It is a beautiful museum, and sure to hold the interest of anyone who visits. There is a gift shop and a paid simulator, and donations are welcome but not required. Located on Hay Street, the Cape Fear Regional Theater has been entertaining audiences in Fayetteville, NC since 1962. Recent family shows include Annie and Junie B. Jones, the Musical. The theater has several shows planned throughout the year geared towards families and a more adult audience. A live theater show is perfect entertainment for a rainy Fayetteville day or evening. Soon enough, the sun will be out more often than the rain, and temperatures will be warming up again, reminding us all of how beautiful spring is in Fayetteville, North Carolina. We hope that you and your family will come out to ZipQuest Waterfall & Treetop Adventure for an exhilarating ziplining experience that you are all sure to love! If you are looking for things to do in Fayetteville, NC this holiday season, you won’t have to look far! Fayetteville is a festive city during the holiday season, from parades to exhibits and more. During the month of December, the Cape Fear Botanical Gardens are hosting their 8th Annual Holiday Lights in the Garden. This year’s events feature Santa’s Workshop and the theme is The Polar Express. On December 1, 7, 14 and 22, adults and children alike can take a ride on the train through the garden for a small admission price. All dates for the 8th Annual Holiday Lights in the Garden are December 1 & 2, 7-9, 14-16, and 19-23. Times are 5:30 PM until 9:00 PM. The Rotary Christmas Parade happens on Saturday, December 8th at 11:00 AM in Downtown Fayetteville along Hay Street. This free event draws a great crowd anxious to see numerous local organizations, bands and of course, Santa himself. If you are near the town of Hope Mills, they will hold their annual Christmas parade on Saturday, December 1st at 3:00 PM along Main Street and Rockfish Road. From December 6th through the 22nd, the Cape Fear Regional Theater will host performances of The Best Christmas Pageant Ever, an annual Fayetteville tradition for over 25 years. 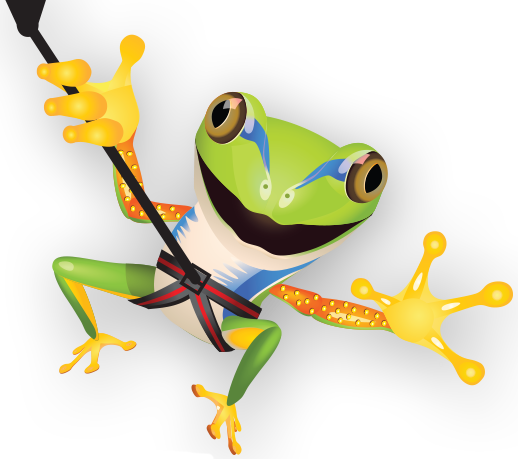 If you are looking for something adventurous to do this holiday season, come see us at ZipQuest Waterfall & Treetop Adventure. Throughout the month of December we have holiday specials on our treetop excursions. Our Excursion package, Expedition package and Holiday Prime package are sure to please everyone in the family. 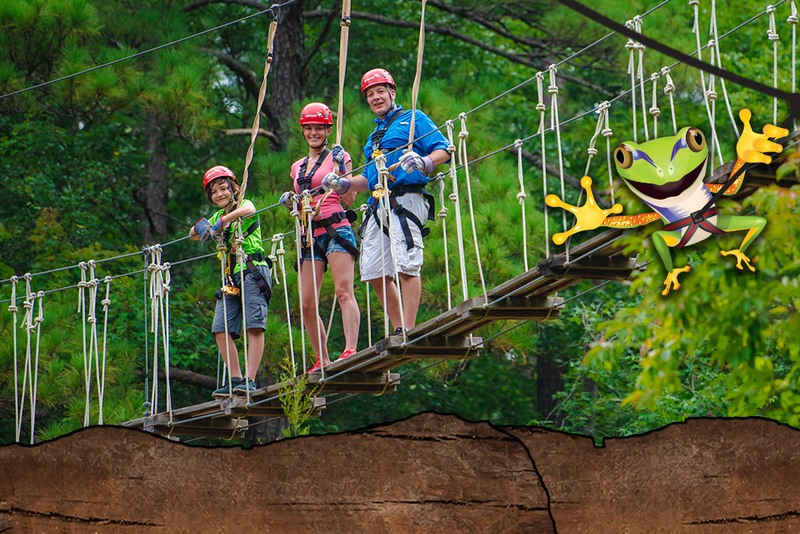 ZipQuest Waterfall & Treetop Adventure is in the business of providing thrilling family fun for everyone ages 8 to 91! This December, take in all of the sights and sounds of the season in beautiful Fayetteville, North Carolina. From residents lining city streets for a parade, to families enjoying the wonderful outdoors at ZipQuest, this December is sure to be one that the whole family will remember. Do you have questions about our holiday packages? Give us a call today at (910) 488-8787. For most local students summer vacation is in full swing! Fayetteville, North Carolina is a great place to be in the summertime as adventure is everywhere! There is no need to travel to find things to do in Fayetteville because there is so much to see and do. If you are looking for unique ideas on how to spend the summer with your children, here are a few fun options. Go SwampDogs Go! From now until the beginning of August, the Fayetteville SwampDogs baseball team will be playing their season at J.P. Riddle Stadium. Most home games feature a theme night. Catch a game with fireworks afterwards and you won’t be disappointed! Individual tickets for single games range from $7 for military and law enforcement to $8 for general admission. Box seats can be purchased for $9. 2018 marks the 100th anniversary since Fort Bragg was established. Every 4th of July, Fort Bragg opens its gates to the public for their annual Independence Day celebration. There are many family friendly activities planned, and this year’s concert headliner is country music artist Trace Adkins. The evening ends with a spectacular fireworks display. Gates open to the public at noon. From now until the end of August, Cape Fear Botanical Gardens is offering a unique display called The Garden Railway. A model railway system will be set up in the Friendship Garden, spanning 450 feet. On certain weekends, visitors to the exhibit will be able to ride and operate hand cars. If your child is a big fan of trains, they are sure to love this exhibit! The Garden Railway is free for garden members, $10 for adults, $9 for seniors and members of the military, $5 for children ages 6 to 12, and free for children 5 and under. 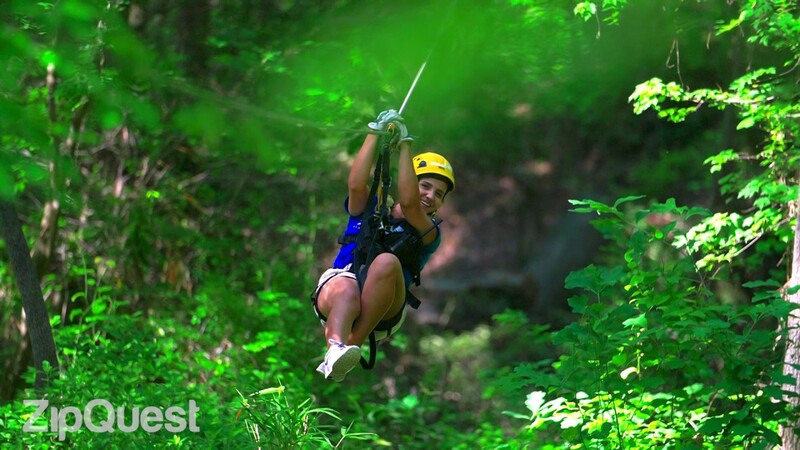 If you are looking for a thrilling adventure, ZipQuest offers ziplining adventures for the whole family! Choose from our Treetop Expedition or our ultimate ziplining adventure overlooking the beautiful Carver Falls, our Waterfall Excursion. Our NightQuest ziplining option offers the same great zipline adventure, but with the night sky for a backdrop. Need an extra boost of adrenaline? Try our Swing Shot attraction, which takes you three and half stories up and releases you toward Carver’s Creek, five stories below! Finding things to do in Fayetteville, North Carolina is not hard. 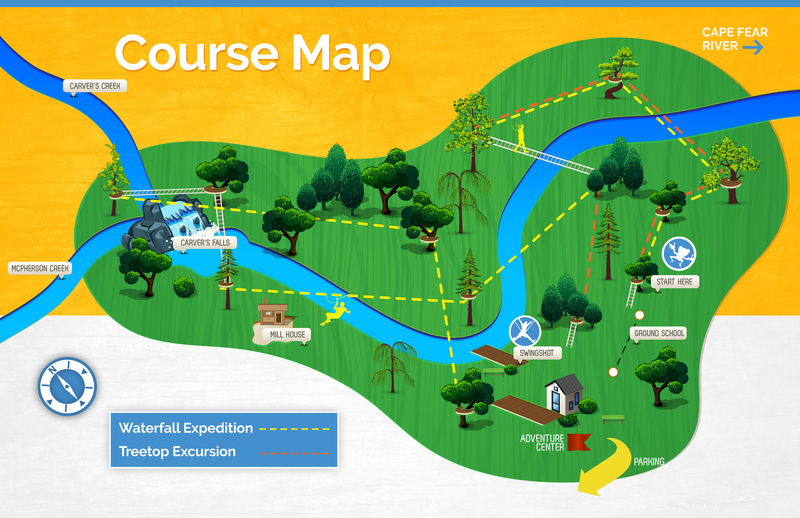 If adventure is what you are looking for this summer, ZipQuest has it!